The M101-2 Sporting News Baseball Supplements Set is comprised of 100 poster-sized supplements, each measuring 7 1/2" x 10". The M101-2 supplements came inside issues of the Sporting News and include a sepia photo of the players with date and the player's name. Backs of the M101-2 supplements are blank. 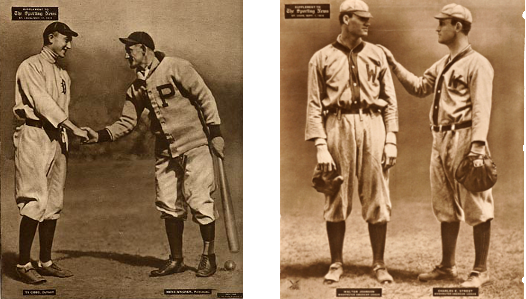 Some of the key Hall-of-Famers featured on the M101-2 posters are: Nap Lajoie, Ty Cobb, Honus Wagner, Ty Cobb, Walter Johnson, and Grover Cleveland Alexander to name a few. CLICK HERE if you want to sell your 1909-13 M101-2 Sporting News Supplements Baseball Cards. Showing 1 to 14 of 14 products.